In the more than four hundred reviews on these pages of all of the relevant rock songs to have been issued during its first two full years from September 1947 through August 1949, one of the most frequently used words to describe what set it apart from all of the other musical genres of the late 1940’s has been ATTITUDE. Though it’s not a pre-requisite that all rock songs must contain an element of brash arrogance, it never hurts to have that in order to connect with an audience that often values boldness above almost anything else. Say what you want about its ever-shifting musical attributes but when you come right down to it no matter what type of rock you’re talking about – rockabilly, punk, funk, grunge or hip-hop – and whether you’re talking about 1949 or about 2019 just around the corner, rock ‘n’ roll music is largely about assertively projecting confidence at every turn. …Even when doing so might have been dangerous to the lives of the performers themselves just for daring to display that attitude in public. Even if you hadn’t seen any pictures of Floyd Dixon, or Eddie Williams and their bandmates for that matter, it wouldn’t be hard to guess they were African-American. I mean, with a name like the regrettable Brown Buddies they weren’t exactly being coy about being proudly melenated. Then there’s also the fact that with just two exceptions – Johnny Otis and Doc Pomus – every single artist partaking in rock ‘n’ roll in the late 1940’s was black. Now take a look at the title of this song again – Red Head ‘N’ Cadillac – and see if you can spot a potential point of contention with the white majority in a racially hostile America of 1949. I’ll give you a minute if you need more time. Yeah, I think it’s fairly obvious. Now it’d be one thing if Dixon and company were merely standing on a corner minding their own business as a voluptuous redhead motored along in a luxury car, not even glancing in their direction. Of course, considering the era they’d have to be discreet about letting their eyes roam as it passed, but they could claim they were just envious of the automobile. That’s understandable, a Caddy would surely be out of their price range, but essentially they’d just be neutral observers who crafted a song about what they saw, akin to somebody writing a song about a bird that caught their eye as it flew by one morning. Surely nobody was accusing Leadbelly of anything untoward by singing Grey Goose. But once you hear the lyrics of Red Head ‘N’ Cadillac any chance for Dixon to sidestep more sinister accusations went out the window, as this song, maybe more than any other to date in rock ‘n’ roll when considering the overall context of the times, defines the cocky and reckless attitude rock music would forever be associated with. It’s not our first time encountering a rock artist, or for that matter their constituency, dreaming of owning a Cadillac. Though hard to envision in the Twenty-First century when its image is that of a car for near-sighted, golf-playing octogenarians to go back and forth to doctor offices and the early bird special at outdated restaurants, back in the mid-Twentieth Century a Cadillac was the ultimate symbol of success in America. Of course for most of black America in 1949 the probability of owning a Cadillac ranked somewhere alongside having a stable full of unicorns to play polo with at your beach-side estate while your Caucasian servants filled your glass with champagne while ducking flying pigs. Yet that’s what made co-opting it so appealing for rock artists as they defiantly stated their intention to climb the social ladder. So when Jimmy Liggins was looking to brashly assert the belief that the African-American outlook was in need of changing back in 1948 he did so by singing Cadillac Boogie, an audacious song which spoke of tomorrow in more ways than just signaling the optimism of attaining increased purchasing power. No, he was singing about cultural revolution with the car merely acting as the symbol of that ascent. 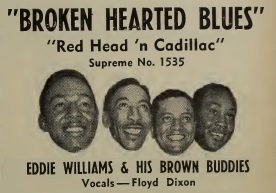 But as forward thinking as Liggins’ vision may have been, and as bold as it was to put on record, it paled in comparison to what Dixon, Williams and their buddies lay out on Red Head ‘N’ Cadillac. For not only are they claiming to be aspiring to get themselves a “fish tail Cad”, but they’re envisioning a sultry red-haired vixen sitting alongside them… if not sitting astride them… as they tool on down the road in plain view of every rabidly racist white American male with an axe to grind, a noose to tie and a corrupt court system in place to get them off for any murder of a colored man they may wish to commit for witnessing such an affront to their way of life. Dixon doesn’t sweat this for a minute as he cockily grins at them while he steps on the gas and flips them off as he rides by. Now let’s just take a breath – and a step back – and analyze this statement by a black man in the context of 1949. There were 48 states in the union at the time and there were Anti-Miscegenation laws applicable in 29 of those states. One year earlier, in 1948, California repealed their law against blacks and whites marrying… the first state since 1887 to do so! It’d take sixteen states until 1967 for it to be legal for interracial marriage and that was only because the Supreme Court ruled on Loving v. Virginia which settled the matter for the entire country. So for Floyd Dixon to be singing on record about hooking up with a red-headed woman was about as bold a thing as you could do. Not only that but he’s asserting that she’ll be so… umm… satisfied with his loving that she’ll willingly purchase for him the car that was the most universally known status symbol on the road for him to drive her around in! This was something so unambiguous that he might just as well have put a target on his back, handed out maps to his house and left detailed instructions for properly installing a time bomb on that Caddy for every redneck across the land who’d be looking to settle the score with him. But that’s rock ‘n’ roll for you… attitude to spare. It’s tempting to stop there, to place this record on the highest shelf in the library, to hand out a ★ 10 ★ for sheer ballsiness, no questions asked. Hell, for guts alone it’d earn that and since Floyd Dixon lived until 2006 I’d say that he more than got away with his middle finger to white America. But a record, even a rock record, needs to embody more than just a smug defiance for it to qualify for the highest honors we can bestow. Here’s where Floyd has to not just sit behind that wheel looking sharp, but he’s also got to be able to steer it along some pretty demanding turns and open it up on the straightaways to show what’s under the hood for us to be really impressed. Luckily this is one car that was put together pretty well even if it IS running on a slightly under-powered musical engine. Maybe because they’re well aware it’ll be the vocals, or rather the lyrics, that will be the focus of every listener’s attention they keep Red Head ‘N’ Cadillac in low gear musically, but at least they affix it with a steady reliable motor to get them where they’re going. Dixon’s piano puts it in gear, slowly and deliberately, but with a certain amount of flash. It’s almost as if he’s relishing pulling out of the driveway in such a fine hunk of metal and wants all of the neighbors to see, so he’s content to just let the engine purr before letting guitarist Tiny Webb step on the gas to pull away with a bit more power. The music recedes once they reach cruising speed, which is about 35 miles per hour tops, and Dixon’s vocals, semi-spoken but with a melodic rhythm to them, come in to boast about his improving fortunes. The opening line we’ve already detailed, and its boldness can in no way be understated, but once he reveals that shocking turn of events he pulls back, shifting his focus to the Cadillac with a well-sung chorus before some excellent instrumental interplay between them all – Dixon’s spry piano, some cutting lines by Webb on guitar, Williams’ steady bass and Ellis Walsh’s quirky drumming. When Floyd returns with the same alluring semi-spoken patter he’s clearly enjoying hearing this fantasy play out, you can almost see him smiling as he offers up a few more specifics, but like most daydreams it starts to be content with the overall ambiance he’s created and so he’s in no rush to advance the story any further and risk having it fall apart all at once. Most notably there’s no reactions offered up as to his parading around with his hot car and hot girl… none from his own buddies who surely would be staring in wide-eyed wonder at his nerve, and more crucially no outraged response by the white establishment to his impudence. I suppose he wasn’t TOO anxious to get lynched at that. But Red Head ‘N’ Cadillac is catchy as can be, the playing is first rate even if it’s not too muscular, and Dixon embodies the character with the right amount of blissful detachment from the realities of what would actually happen were he to be in the company of a ginger-haired beauty on Main Street in a high-end convertible. For those of us wanting an even more outrageous conclusion to the story, like say them heading off down the road with tin-cans tied to the bumper after they got married as they ran an irate sheriff and his mob of toothless cronies into a ditch, would have to be content that Dixon got away with as much as he did, even if it was just on wax. 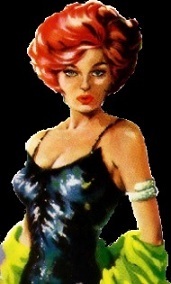 It’s impossible to conceive of another brand of music in 1949 displaying the attitude shown in Red Head ‘N’ Cadillac. Pop of course didn’t believe in even white couples doing more than holding hands while sharing a soda until they’d been married for a few years. Jazz was too respected to sully itself in such tawdry affairs as this by now. Blues was largely resigned to the mistreatment all around them, while Gospel sought vindication for enduring that plight in a heavenly life after death. But rock ‘n’ roll wasn’t going to wait around for that. Not when there were Cadillacs rolling off the assembly lines in Detroit and plenty of sultry redheads on every corner waiting to be picked up. Besides, if the lynch mob was going to fall behind in pursuit it was a good bet they’d be driving beat up old pickup trucks and second hand jalopies that wouldn’t be able to catch Floyd and his red headed concubine in their eight cylinder Caddy anyway. Leave a reply on "Eddie Williams And His Brown Buddies: “Red Head ‘N’ Cadillac”"